MADRID (AP) — Sevilla took full advantage of Lionel Messi’s absence, beating Barcelona 2-0 in the first leg of the Copa del Rey quarterfinals on Wednesday. Pablo Sarabia and Wissam Ben Yedder scored in the second half to give Sevilla a big edge in the rematch of last year’s final, which Barcelona won for its fourth straight Copa title. Sevilla also lost the 2016 final to its Catalan rival. Barcelona is defending its Copa title despite allegedly using a suspended player against Levante in the round of 16. The Catalan club was not disqualified because Levante’s complaint to the Spanish soccer federation missed a deadline. A subsequent appeal by Levante to a sports tribunal was dismissed on Wednesday. It was an even match at Ramon Sanchez-Pizjuan Stadium, but Sevilla was able to take advantage of Barcelona’s depleted squad. Sarabia opened the scoring with a volley from inside the area in the 58th minute after a cross by Quincy Promes, and Ben Yedder sealed the victory in the 76th with a close-range touch after Ever Banega’s low shot took a deflection. 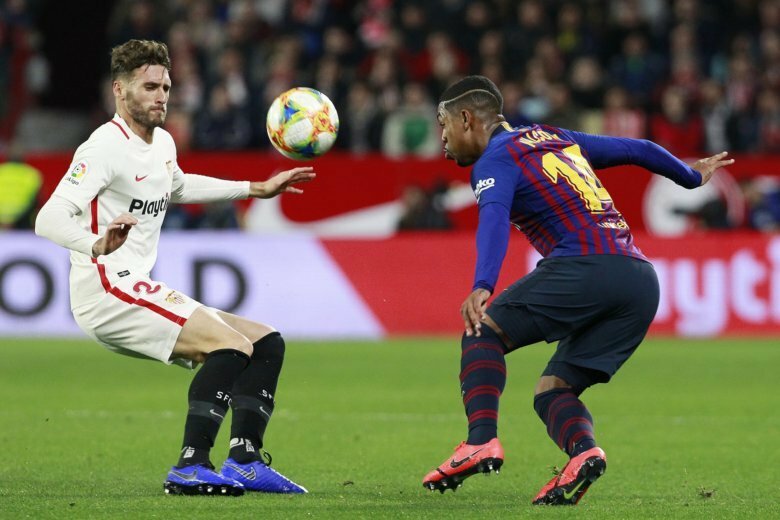 Malcom had Barcelona’s best chance near the end of the first half, getting past goalkeeper Juan Soriano but missing the open net with his angled shot. Valverde rested Messi and other players ahead of a sequence of important matches in upcoming weeks, including in the round of 16 of the Champions League. Messi also didn’t play much in the team’s 3-1 win over Leganes in the Spanish league on Sunday, scoring the third goal in stoppage time after coming off the bench in the second half. Among the players used by Valverde in Seville was newly signed forward Kevin-Prince Boateng, who had practiced only once since being signed from Italian club Sassuolo. He was replaced by Luis Suarez in the 63rd minute, shortly after Sevilla opened the scoring. Valverde also threw on Philippe Coutinho following Sevilla’s goal, taking Malcom out of the match, but the changes did little to help Barcelona.